And, here I thought I was a “cool” mom. That I might even be promoted to M.I.L.F status when the kids are old enough to know what the “F” in M.I.L.F stands for. After all, it’s secretly — and sometimes not so secretly — what most Orange County moms aspire to. So, C.J.’s Dad got us Sirus Radio when we got a new car and stopped living the mini-van dream. Kids Place Live is my channel of choice when the kidlets are passengers; it’s Cosmo Radio when I’m riding solo. 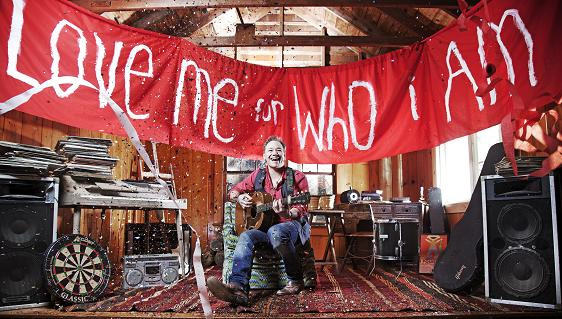 And, our favorite song on Kids Place Live is Brady Rymer’s “Love Me For Who I Am.” The main line in the song? The main take-away? “Please don’t try to fix me, love me for who I am.” Sing it Brady! It reminds me so much of C.J. The song was inspired by differently-abled kids, but could be an anthem for any kid who is different. NPR says that Brady Rymer and his rootsy, funky rock ‘n’ roll band “might just be the best-sounding band in children’s music.” C.J. agrees and gives Brady Rymer two little thumbs up…actually he puts his two index fingers up and thinks he’s giving the thumbs up sign, but you get the drift. Enjoy the lyrics! This entry was posted in All Posts and tagged Brady Rymer, Cosmo Radio, Gender, gender creative, gender nonconforming, Gender Stereotypes, Kids Place Live, Orange County, raising a gay child, Raising gay child, Raising My Rainbow, Sirus Radio. Bookmark the permalink. I came across this blog and thought i would see if i could get some the blogs i read to help promote as it really seems this young couple need some help. So if you could give it a look not saying you need to donate you could help by maybe blogging about it or passing it on to fellow bloggers getting the word out is just as much help as donating. This guy was just at Lollapalooza…I knew I remembered seeign the name somewhere, LOL! These days, my anthem is Pink’s, “F*ckin’ Perfect”. There is a clean version that I want to share with my daughter (Pretty, pretty please, don’t you ever, ever feel that you’re less than, less than perfect. Pretty, pretty please, if you ever, ever feel like you’re nothing, you are perfect to me). She’s got some great songs about just being yourself. And I rock out to them in my car all the time, singing at the top of my lungs. A great message for kids. Reminds me of the “Free To Be You And Me” record that I wore out as a kid.